The present study was conducted to determine the thoughts of children, whose lives are governed by decisions taken by adults, on the right to self-determination. The study was conducted with phenomenological method, a qualitative research design. The study group included 16 children. The data were collected with semi-structured interviews conducted with children. Before the data collection process, the solo test game was played with children as ice breaker. After the solo test game, the modified version of the Cinderella fairy tale was read by the children and they were asked questions about the fairy tale. The objective of the modified Cinderella tale was to make children imagine a world where the decisions are taken by children. After the fairy tales, the semi-structured interview was conducted. The interviews were conducted upon the approval of the children to record the conversations, and the replies provided by children who did not provide approval for voice recordings were noted by the first author. The findings were analyzed with descriptive analysis. Based on the analysis results, the collected data was grouped in five categories that were organized under two themes. In conclusion, students stated that they were able to decide on daily matters such as selecting clothes, what to eat, however, they were presented with no choices in matters that could affect their lives such as school selection. Children stated that adults do not believe that children can make decisions on issues relevant to children’s lives. Keywords: Self-determination right, right to participate. PEKINCE, Pelin; AVCI, Neslihan. Children’s Perspective on the Right of Self-Determination. International Electronic Journal of Elementary Education, [S.l. ], v. 10, n. 4, p. 431-439, apr. 2018. ISSN 1307-9298. 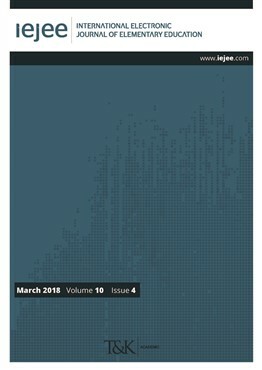 Available at: <https://iejee.com/index.php/IEJEE/article/view/324>. Date accessed: 19 apr. 2019. Alderson, P. (2005). Children as researchers: The effects of participation rights on research methodology. Educação & Sociedade, 26(91), 419-442. Akyol, S. (2011). Çocuk hakları’na dair sözleşme çerçevesinde çocuğun görüşlerime saygı ilkesi (Varlığının sahibi olan çocuk). 1. Türkiye Çocuk Hakları Kongresi Yetişkin Bildirileri Kitabı (pp. 183-188). İstanbul: Çocuk Vakfı Yayınları. Archard, D. (2004). Children rights and childhood. London: Routledge Press. Bäckman, E. & Trafford, B. (2007). Democratic governance of schools (Vol. 383). Council of Europe. Birleşmiş Milletler Çocuk Hakları Komitesi, (1995). Çocuk Haklarına Dair Sözleşme. 27 Ocak 1995 tarihli ve 22184 sayılı Resmi Gazete. Birleşmiş Milletler Çocuk Hakları Komitesi, (2009). Çocuk haklarına dair sözleşme genel yorum no: 12 çocuğun dinlenilme hakkı. Elli Birinci Oturum, Cenevre. Christensen, P. & Prout, A. (2002). Working with ethical symmetry in social research with children. Childhood, 9(4), 477-497. Coleman, P. (2000). Aging and the satisfaction psychological needs. Psychological Inquiry, 11(4), 291-294. Corsaro, W. A. (1997). The Sociology of Childhood. London: Sage Press. Darbyshire, P. (2000). Guest Editorial: From Research on Children to Research with Children. Neonatal, Paediatric and Child Health Nursing, 3(1), 2-3. Darbyshire, P., Schiller, W. & MacDougall, C. (2005). Extending new paradigm childhood research: meeting the challenges of ıncluding younger children. Early Child Development and Care, 175(6), 467-472. Deci, E. L., Connell, J. P. & Ryan, R. M. (1989). Self-determination in a work organization. Journal of Applied Psychology, 74(4), 580-590. Deci, E. & Ryan, R. (1985). Instrinsic motivation and self-determination in human behavior. New Yok: Plenum Press. Edwards, M. (1996). Institutionalising Children's Participation in Development”, Participatory Learning and Action Notes, 25. London: International Institute for Environment and Development. Elkind, D. (1999). Çocuk ve toplum- gelişim ve eğitim üzerine denemeler. (B. Onur & D. Öngen, Çev.). Ankara: Ankara Üniversitesi Basımevi. Firestone, S. (1979). Cinselliğin diyalektiği, kadın özgürlüğü davası (Y. Salman, Çev), İstanbul: Payel Yayınları. Giroux, H. (2009). Youth in a suspect society: democracy or disposability?. New York: Springer Press. Grolnick, W. S., Gurland, S. T., Jacob, K. F. & Decourcey, W. (2002). The development of self-determination in middle childhood and adolescence. In A. Wigfield & J. S. Eccles (Eds), Development of Achievement Motivation, (pp. 147-171)., San Diego: CA: Academic Press. Hart, A. R. (2016). Çocukların katılımı. (T. Ş. Kılınç, Çev).Ankara: Nobel Akademik Yayıncılık. Heywood, C. (2003). Baba bana top at!- Batı'da çocukluğun tarihi. (E. Hoşsucu, Çev.). İstanbul: Kitap Yayınevi. Holt, J. (2000). Çocukluktan kaçış. (S. Yılancı & C. Aksoy, Çev.). İstanbul: Beyaz Yayınevi. James, A., Jenks, C. ve Prout, A. (1998). Theorizing childhood. Williston: Teachers College Press. Kjorholt, A. T. (2008). Children as new citizen” In A. Jameson & A. Jameson (Eds. ), European Childhoods. (pp. 14 – 37). New York: Palgrave Macmillan Press. Madge, N. (2006). Children these days. Clifton: Policy Press. Merriam, S. B. (2013). Nitel araştırma: Desen ve uygulama için bir rehber. (S. Turan, Çev. Ed.). Ankara: Nobel Yayıncılık. Oakley, A. (1994). ‘Women and children first and last: Parallels and differences between children’s and women’s studies’, (13-32). In B. Mayall (Ed.). Children’s childhoods observed and experienced, London: The Falmer Press. Oktay, A. & Kumbaroğlu, N. (2011). Öğretmenlerin ve öğrencilerin çocuk haklarına bakışının değerlendirilmesi. 1. Türkiye Çocuk Hakları Kongresi Yetişkin Bildirileri Kitabı (pp. 365-379), İstanbul: Çocuk Vakfı Yayınları. Onur, B. (2005). Türkiye’de çocukluğun tarihi. Ankara: İmge Kitabevi. Patton, M. Q. (2014). Nitel araştırma ve değerlendirme yöntemleri. (S. B. Demir, Çev.). Ankara: Pegem Akademi Yayınları. Pavese, C. (2012). Yaşama uğraşı, günlükler (1935-1950). (C. Çapan, Çev. ), İstanbul: Can Yayınları. Perry, B. D. Szalavitz, M. (2013). Köpek gibi büyütülmüş çocuk. (Elif Söğüt, Çev.). İstanbul: Okuyan Us Yayıncılık. Postman, N. (1995). Çocukluğun yok oluşu. (. K. İnal, Çev). Ankara: İmge Kitabevi. Punch, S. (2002). Research with children. The same or different from research with adults?. Childhood, 9(3), 321-341. Save the Children (SC), (2010). Children’s Right to be Heard an Effective Protection. Sweden. Sorin, R. (2005). Changing Images of Childhood-reconceptualising Early Childhood Practice. International Journal of Transitions in Childhood, 1, 12-21. Woodhead, M. & Faulkner, D. (2000). Subjects, Objects or Participants., In P. Christensen & A. James (Eds.). Research with Children: Perspectives and Practices. (pp. 9-33). London: Falmer Press.